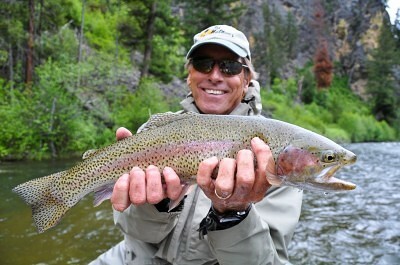 Our Fly Fishing Vacation Packages are a Great Deal! Pricing is based on double occupancy. Call 406-544-3516 for details and availability. LIMITED DATES AVAILABLE – Call Today! Wed. was day one with long time clients, Gregg Kimball, David Joyner, Steve Dunleavy and this year they also brought first timer, Larry. I had Gregg and Larry in my boat and I was joined by fellow guide, John Gould. Larry had a few hook-set hiccups early on but Gregg kept us busy with several smaller fish on the dropper before finally coming tight on a big rainbow. After a long fight we had the 19″ bow in the net which turned out to be our best fish of the morning. Larry didn’t take long to catch on and a couple runs later the guys doubled up on trout and then one of the huge old bull trout starting chasing the fish on the end of our line. He never grabbed one but it was still cool to watch. Tricos were going strong by the time we made it to Munchmore and Larry and Gregg took turns drilling fish in there. It’s the best that hole has fished form me in a while and the guys hooked up on a pile of cutthroats. A lot of them were smaller fish but there were at least 8 that went 15+”. After that we gave up the spot for Steve and David, and we found more rising fish further downstream. Gregg took another 4 nice cutts before we pulled in for lunch. The afternoon was a mixed bag of hoppers, droppers, and little ants. Larry did well with the dropper connecting with several more great cutts including an 18″ brute, and he also hooked a monster brown that ran straight at the boat, jumped and then broke us off. Gregg found most of his fish on the hopper and a couple on the ant as well. He even hooked a bull trout on the hopper in some fast water. I thought for sure it was a big rainbow, but after an epic battle through shallow rocks and boulders it turned out to be a 23″ bull trout. It was another great Blackfoot day. The guys caught their share of little trout and really good numbers of quality fish from 15-17″ with a few bigger ones as well. .